Archaeopress is devoted to publishing academic work on all aspects of archaeology quickly and efficiently. We publish across a range of imprints including Archaeopress Archaeology (peer-reviewed monographs and edited volumes), 3rdGuides (accounts of early travellers with an archaeological bias), Access Archaeology (refereed monographs and edited volumes) and Praehistorica Mediterranea. Our growing range of journals currently includes the Proceedings of the Seminar for Arabian Studies, the Journal of Greek Archaeology and the Journal of Hellenistic Pottery and Material Culture. Click here to find full details including style and submission guides for publishing in Archaeopress Archaeology. Our newest imprint is designed to make archaeological research accessible to all and to present a low-cost (or no-cost) publishing solution for academics from all over the world. Material will range from theses, conference proceedings, catalogues of archaeological material, excavation reports and beyond. All archaeological content will be considered covering all archaeological topics, all geographic locations and all time periods. All books will be refereed prior to publication. We will provide type-setting guidance and templates for authors to prepare material themselves designed to be made available for free online via our Open Access platform and to supply in-print to libraries and academics worldwide at a reasonable price point. Authors able to supply print-ready files will pay no charge to publish in Access Archaeology. Authors able to supply type-set material suitable for digital publication in our Open Access platform but not considered print-ready will pay the Single Monograph Fee of £100 (+VAT if applicable). These titles will remain available online only as free to download PDF eBooks. Type-setting services are available for an additional fee. Click here to find full details including style and submission guides for publishing in Access Archaeology. An international peer-reviewed English-language journal specializing in synthetic articles and in long reviews. Work from Greek scholars is particularly welcome. 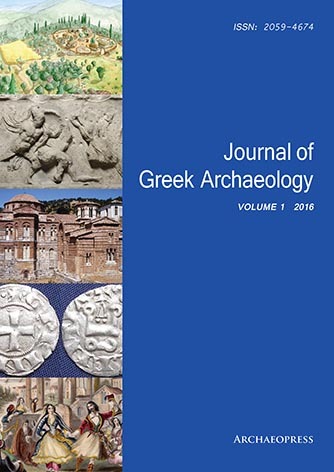 The scope of this journal is Greek archaeology both in the Aegean and throughout the wider Greek-inhabited world, from earliest Prehistory to the Modern Era. Thus we include contributions not just from traditional periods such as Greek Prehistory and the Classical Greek to Hellenistic eras, but also from Roman through Byzantine, Crusader and Ottoman Greece and into the Early Modern period. Outside of the Aegean contributions are welcome covering the Archaeology of the Greeks overseas, likewise from Prehistory into the Modern World. Greek Archaeology for the purposes of the JGA thus includes the Archaeology of the Hellenistic World, Roman Greece, Byzantine Archaeology, Frankish and Ottoman Archaeology, and the Postmedieval Archaeology of Greece and of the Greek Diaspora. Click here to find full details including style and submission guides for submitting articles to JGA. JHP is scheduled to appear once a year, more often if necessary. It provides a forum for all kinds of studies on Hellenistic pottery and everyday objects. Apart from professional articles, the journal contains book reviews, short presentations of research projects (including dissertations) and general news. The preferred language is English. Contributions in German and French will be accepted if they are supplemented by a detailed English summary. Click here to find full details including style and submission guides for submitting articles to JHP.